In college guitar classes, when it came to the time that I would introduce tablature, I got four students to volunteer to become temporary thespians. The cast included Mom, Johnny One Note, SuperMusician, and a narrator. Once I found four worthy volunteers (it wasn't difficult) I directed them to read the following mini-play that I had written. 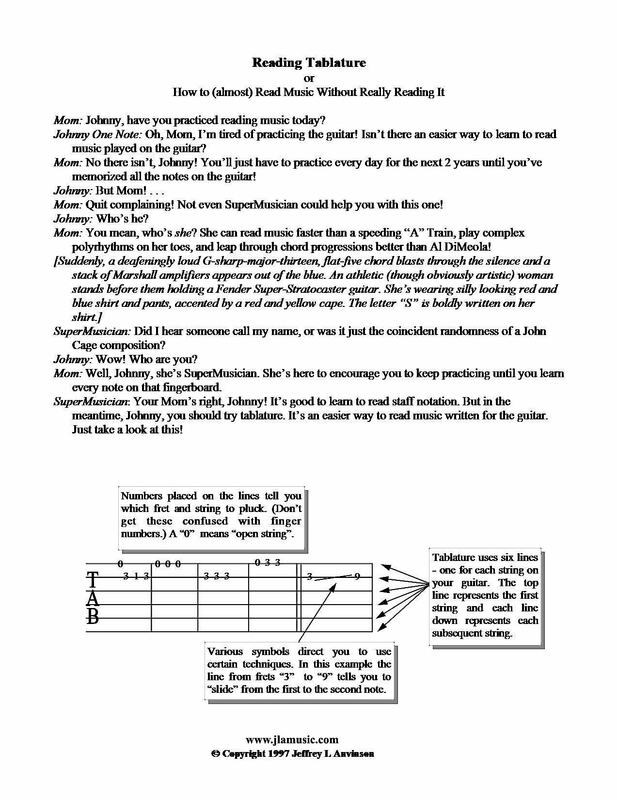 It was always a great way to introduce the subject of tablature. Just for fun, perhaps you could find three friends to join you and read it! Tablature has been in existence for centuries in various forms. If you're interested, check out the seminal book by James Tyler: The Early Guitar: A History and Handbook. TIP: Find some early German tablature from centuries ago and try to read it - it will blow you away!